Dr. Thurman Richard White, Ed.D., MA, AS, has had a long career in business management, both as leader in an established corporate culture, and as an entrepreneur in newly established businesses. He currently resides in the Nashville, Tennessee area, teaching and working as an information services professional. "Throughout the history of business practices in the Unites States, we have been inundated with many books concerning the way we ought to conduct business. Most of these books contain schools of thought that promise positive results if one follows better business practices. These books pretend to understand and explain business practices of corporate America; however, these books lack the science that explains and differentiates good and/or bad business practice outcomes. This book is structured differently. It is about my personal business experiences as an insider working with both the amazingly brilliant business people as well as the galactically inane. The case studies sited in this book relate to personal experiences and the application of science management. The reader will not be inundated with espoused theoretical commentary brought about by an armchair philosophy or academic conjecture. 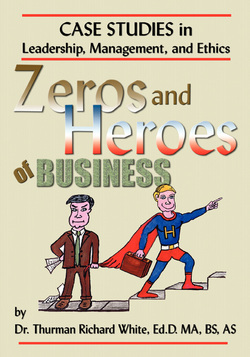 The case studies in this book contain interoffice memorandums and other related items pertaining to the business practices of several fortune 500 companies as well as State Medicaid bids in the area of healthcare computer technology. The reason for the inclusion of these business documents is for the reader to test the inferences for statistical significance and have the reader draw their own conclusions concerning management practices. This is not outside looking in; it is about inside speaking out."